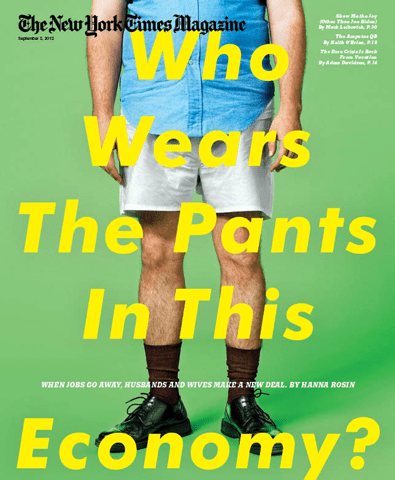 An article in the September 2, New York Times Magazine titled “Who Wears the Pants in this Economy?” caught my attention. This piece used several specific examples of couples in which the man, who had been the major wage earner for years, had become either unemployed or under-employed while his wife, who either had not worked previously or who had worked less than her husband, had become the major wage earner in the family. This phenomenon seems due to a number of factors; the availability of more service jobs that have been primarily women’s jobs, the disappearing of manufacturing jobs that have been primarily male as well as changes in male and female levels of education. The article seemed only to hint at what seems to be a shifting in power between men and women. While this is interesting, for me as an educator, some of this is not surprising. I teach in a community college and over the last several years, I have noticed a disturbing trend. When I talk with students, or just observe their behavior, I find that for the most part, and of course there are individuals who do not fit the trend, my young women students are more serious, more driven and more ambitious than the young men. They attend class more and usually they can articulate future plans more thoroughly than young men. When our national two-year honor society inducted new members last spring, 60% of the new inductees were women. Since 1979, more women have graduated from college than men, and while the national wage gap between men and women still shows that on the average women earn 77% of what men make, urban, college-educated women in the mid-twenties to mid-thirties age group are out-earning men in that same age group. I applaud the increases in women’s income, but what concerns me more is what is happening to our young men. I find, in general, that our young men are less engaged in education, less inclined to work hard in school, less inclined to ask for help, less diligent about class attendance than my young women students. While it is easy to have a knee-jerk response that our public schools are failing our boys, I think that is not a terribly satisfying answer. I think there are broader cultural ideas at work as well. Current media tends to celebrate the perpetually adolescent young man. Any movie made by Judd Apatow demonstrates this. What makes this model acceptable? The only questions his movie Knocked Up raised for me were, why would a woman sleep with that unappealing, immature character, and why would she marry him? It was so clear that the character played by Katherine Heigl was superior in every way to the slobbish, immature character played by Seth Rogen, I could only ask “What was she thinking?”. The answer that she wasn’t thinking is unsatisfying because she was clearly thinking about other parts of her life. For many young men in the media, the ideal life seems to consist of playing video games and drinking beer, and never having to do the dishes. I come from the generation of young women that was told that being smart would turn boys away. The cultural advice was to listen to the boy, ask him for help (with math, with anything), and not to express any ideas that might challenge his superiority. For many of us, that advice seemed absurd. Not that we wanted to brag about ourselves, but we also did not want to suppress our intelligence. What I see in many of my young women students is a freedom to express themselves, to be daring, and the ability to understand that hard work will reap rewards. One of the young women in one of my classes told us that she had been sky diving and bungee jumping over the summer. I often do not see these traits in my young men. There are exceptions. I see involvement and engagement in older men who are returning to college, in men who have been in the military or sometimes in men who have had trouble with the law. Conventional wisdom has always said that girls mature faster than boys, but that does not explain the change over the last generation in maturity among boys in their late teens and early twenties. I wonder if living in a culture where there is often no longer a straight path to a career, a culture where independence is not necessarily celebrated, (think how few children are allowed to roam around town, around local woods or walk to school), and a culture where those hands-on manufacturing jobs that were the center of our economy are fast disappearing has left many of our young men drifting. I wish I had the answers. I wish I could figure out ways for all teachers to engage young men because while articles like the one in the September 2, New York Times are interesting, what we really need to be working for are generations of young men and women who are equally engaged in learning, equally dedicated to creating a better life for themselves and their children, and who equally understand that success only comes through hard work. Like you, I have noticed the lag of boys behind the girls. I am disturbed by the “dummy down” of the male image in the media and films. If the media portrayed women as they do men in commercials on TV, there would be a revolt. I think the images of men we see on TV are beginning to manifest themselves in real life. If one is portrayed as a beer drinking, video playing looser, then one will be one. The lack of real male models for young men to emulate also has a major impression on boys. Single families and dysfunctional lifestyles contribute to the problem. In the criminal justice world, most trouble youths are young minority males where there is very little influence from male role models. In my classes, fifty percent of my students are female. They too, are far more mature in career selection and goal orientation then the males. I have little if any trouble from the female students, however, the males tend to be less motivated and lack fundamental learning skills. A sign of the times, or maybe time for the “Woman to Roar.” Wow, I am glad I am just an old guy. I keep wondering if perhaps this is because most teachers are women (http://www.ncei.com/POT05PRESSREL3.htm). Is there a sub-conscious bias in the classroom that perhaps affects boys? I also echo Dave’s comments–it seems that the men portrayed in the media are uneducated and negative. It’s a complicated subject and think there are many causes. Great post, Jane…one I’ll be thinking about.